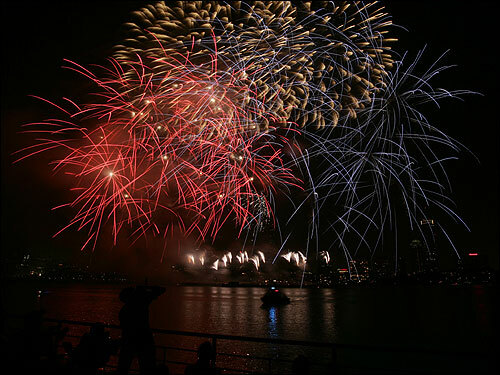 Lapdog Creations: Aerosmith... Boston Pops... Fireworks! 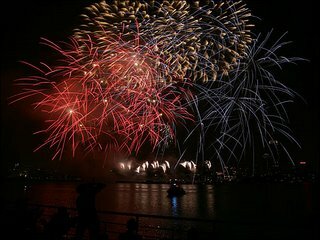 After little sleep, I'm happy to report that despite the iffy weather, we enjoyed a wonderful fireworks display in Boston last night ... the largest 4th of July celebration in the USA! Even though I grew up just 35 minutes away, this was actually the first time I've ever ventured in to Beantown for the 4th celebration, as having become members of the Museum of Science made it a bit easier this year (i.e. we did not have to arrive at the crack of dawn and spend 15 hours sitting out in the elements guarding our 2 feet of space - oh the luxury!). The museum holds a special "members only" event (though they still charge you quite nicely!) where we were able to watch the display from atop their parking garage. We still had to guard our space, but at least not with everyone lined along the Charles River! Gorgeous fireworks!!! Did you take those pics? Wow! Sounds like you had a good time! Shh... they were "borrowed," as I'm not that good at taking fireworks pics!